The Danish company, Bang & Olufsen has never been accused of creating cookie cutter products and they have broken the mold again with the BeoVision 8, a 32" LCD that delivers a cinema like picture. In their brochures with product shots of children scampering by, B & O portrays the elegantly styled BeoVision 8 as a casual TV that is "easy to move between the summer cottage and the guest room." Since it weighs about 45 pounds, it is fairly portable. But don't assume that this HDTV is a lightweight performer. In fact, it succeeds in producing a more home theater-like experience than many TVs I've seen that are twice its size. With its subdued cinema quality picture, the BeoVision 8 does not exhibit the sharp poppingly bright image that attracts the patrons at the big box emporiums. The expansive integrated audio system reinforces the surprising home theater experience that you wouldn't think possible from a 32" LCD. With only one HDMI input, no USB input and no Ethernet port, I can't give this TV a stellar mark for features. Of course, I don't think David Lewis designed the BeoVision 8 to be the Swiss Army knife of TVs. Dead simple to set up. The real learning curve is with the idiosyncratic Beo4 remote. Though once you get the feel for it, you may never want to go back. 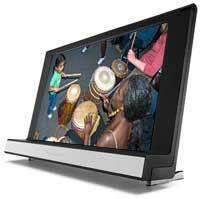 The BeoVision 8 is one of the most expensive 32" LCD 720p HDTVs in the marketplace. For the price, you receive home theater quality picture and sound in a TV that looks like no other. How much is that combination worth to you?